* First, How Can I Make My Home More Energy Efficient? * Is Wind Energy Practical for Me? * What Size Wind Turbine Do I Need? * What Are the Basic Parts of a Small Wind Electric System? * What Do Wind Systems Cost? * How Do I Find a Certified Small Wind Turbine? * Where Can I Find Installation and Maintenance Support? * How Much Energy Will My System Generate? * Is There Enough Wind on My Site? * How Do I Choose the Best Site for My Wind Turbine? * Can I Connect My System to the Utility Grid? * Can I Go Off-Grid? Prior to conducting an on-site measurement campaign, some small wind project developers use state wind maps to conservatively estimate the wind resource at turbine hub height. While these maps can provide a general indication of good or poor wind resources, they do not provide a resolution high enough to identify local site features. State wind maps cannot include information on complex terrain, ground cover, wind speed distribution, direction distribution, turbulence intensity, and other local effects. Purchased maps or services can often provide higher resolution and more flexibility with zooming, orientation, and additional features. Pay attention to a map’s height above ground as it relates to the potential project’s tower height. Adjusting the wind speed for the height difference between the map and the turbine height adds a potential source of error depending on the wind shear exponent that is selected, and the greater the height difference the greater the potential error. Therefore, for small wind generator applications, 30- to 40-m wind maps are far more useful than 10-, 60-, 80-, or 100-m wind maps. It is also important to understand the resolution of the wind map or model-generated data set. If the resolution is lower than the terrain features, adjustments will be needed to account for local terrain effects. Local airport or weather stations can offer local wind data, but these data may be less reliable than actual site data. If airport data (typically recorded at 30 ft or 10 m above ground) or weather station data (typically recorded at 5 to 20 ft above ground) are used, inquire not only about the site’s current equipment and location but also if it is historically consistent with the data collection equipment and siting. Equipment at these sites is not primarily intended for wind resource assessment, so it may not be positioned at an appropriate height or in a location free of obstructions. Unfortunately, airport and weather stations are usually far from the site of interest, with considerably different orography, tree cover, and monitoring height, making these data of questionable usefulness. Given the expertise required to effectively establish and correlate wind resource data, the data provided by airport and weather stations may only provide a rough screening assessment. Another useful indirect measurement of the wind resource is the observation of an area’s vegetation. Trees, especially conifers or evergreens, can be permanently deformed by strong winds. 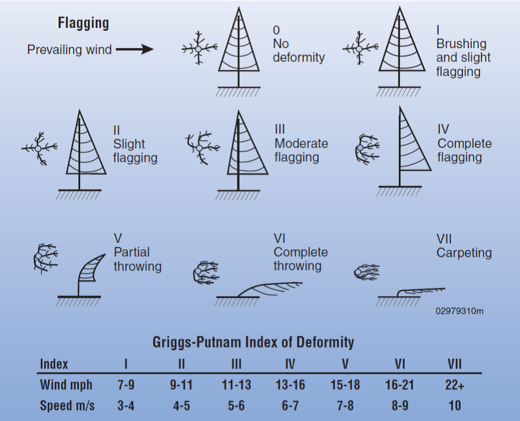 This deformity, known as “flagging,” has been used to estimate the average wind speed for an area. Small wind site assessors can help you determine whether you have a good wind resource on your site. State or utility incentive programs may be able to refer you to site assessors with training in assessing the wind resource at specific sites. Computer programs that estimate the wind resource at a particular site given specific obstacles are also available. Site assessors and computer programs can help to refine the estimates provided on wind resource maps. 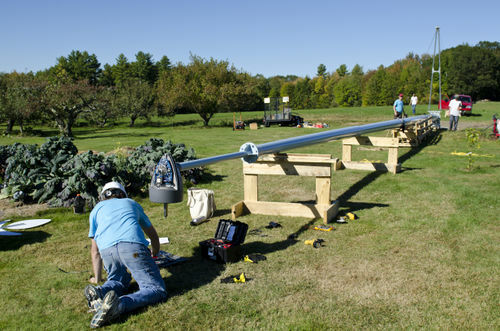 On-site data measurement adds a new layer of confidence to the techniques discussed above, but with substantial additional costs, effort, and time, especially when the preferred methodology is to match turbine hub height and collect data for a minimum of 1 year. Obtaining several years of data is better, or 1 year that can be referenced to a longer-term data set if there is good correlation with the on-site data. A number of small, affordable wind data collection systems are available for on-site measurement and are best run for at least 1 year. These systems include anemometers, wind vanes, and temperature sensors that are mounted as close to hub height as possible. Calculating the wind shear exponent requires collecting data at two different heights. 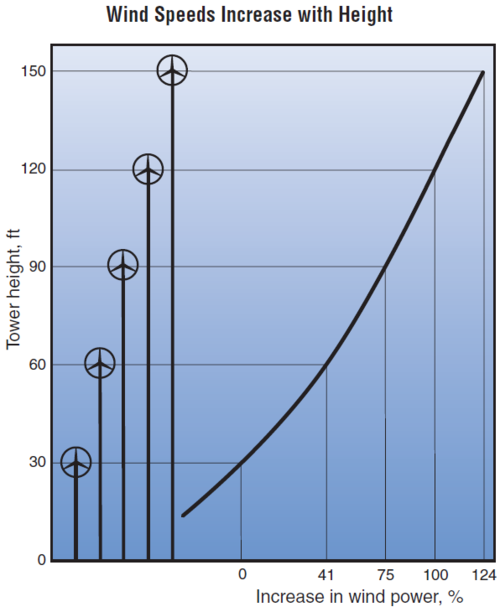 Having wind shear data is essential for conducting an accurate analysis of the cost versus benefits of taller towers. In addition, analysis must be performed to determine wind speed averages and extremes, wind distribution, Weibull parameters, the wind direction rose , turbulence intensity, vertical wind shear exponent, and associated uncertainties. ↑ "National Renewable Energy Laboratory. Wind Energy Resource Atlas of the United States"
↑ "National Renewable Energy Laboratory. (2015). Small Wind Site Assessment Guidelines"
↑ "U.S. Department of Energy. Planning a Small Wind Electric System"
This page was last modified on 9 May 2016, at 16:29.